KUALA LUMPUR, Malaysia — During a ceremony steeped in royal tradition, Tuanku Abdul Halim Mu'azam Shah, 84, was recently installed as the 14th Yang di-Pertuan Agong. The event took place at the new Istana Negara (royal palace) in Kuala Lumpur and was followed by a formal banquet at the Malaysia New National Palace in Jalan Duta, Kuala Lumpur. This was attended by members of the Rulers, Prime Minister Datuk Seri Najib Tun Razak, Deputy Prime Minister Tan Sri Muhyiddin Yassin, Cabinet ministers, foreign ambassadors and senior government officials. Also present was a HARMAN Studer Vista 5 M2, supplied by Mahajak Trio, the territorial distributor, which recorded the occasion. The program was sent to air nationwide on Radio Televisyen Malaysia (RTM), with a total of 32 microphone channels used throughout the night. The Vista 5 M2 console was selected for its innovative qualities, flexibility, ease of use, the precise meter bridge (displaying every status the sound engineer needed to see), user-friendliness of the Vistonics™ screen — and finally the fact that the console is aesthetically very attractive. 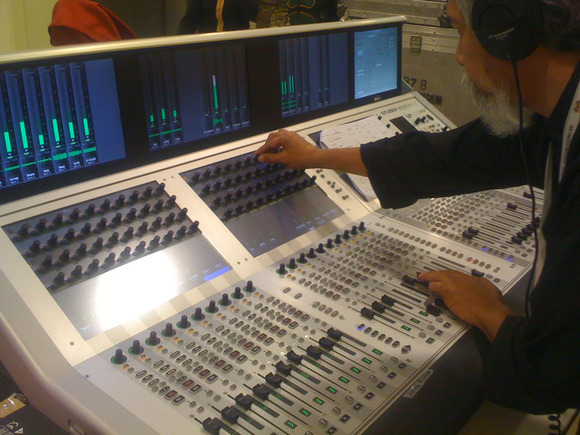 “The Vista 5 M2 enabled the sound engineers to implement fast copy-paste of all the parameters while the Vistonics interface provided immediate access to parameters by opening up settings onto the encoder, such as EQ, Dynamic, VCA and channel setting, without wasting time searching for any hidden buttons,” said Mahajak Trio’s Senior Manager Sales & Project, Lee Chin Kah. Another key feature used to mix the event was ‘Master Contributions’, enabling the sound team to view and control all the contributions on Vistonics faders. The cues were used to upmix thestereotransmitted signal to a5.1 channel signal, and the professional broadcast contributed substantially to the event’s success. Tuanku Abdul Halim Mu'azam Shah had been appointed on December 13 last year to succeed Sultan Mizan Zainal Abidin of Terengganu, whose 5-year term as the 13th Yang di-Pertuan Agong had ended.